Global Marine Sealants Market size was valued over USD 200 million in 2016 and will surpass 65 kilo tons by 2024. Expansion in global cargo trade along with rising number of trade blocks has enhanced the marine sealants market growth. Also, growth in intra-regional merchandise trade has enhanced the product demand. Global offshore vessel industry was worth of USD 15.8 billion in 2017 and is expected to reach USD 20.13 billion by 2024, with a growth rate of 4.91%. 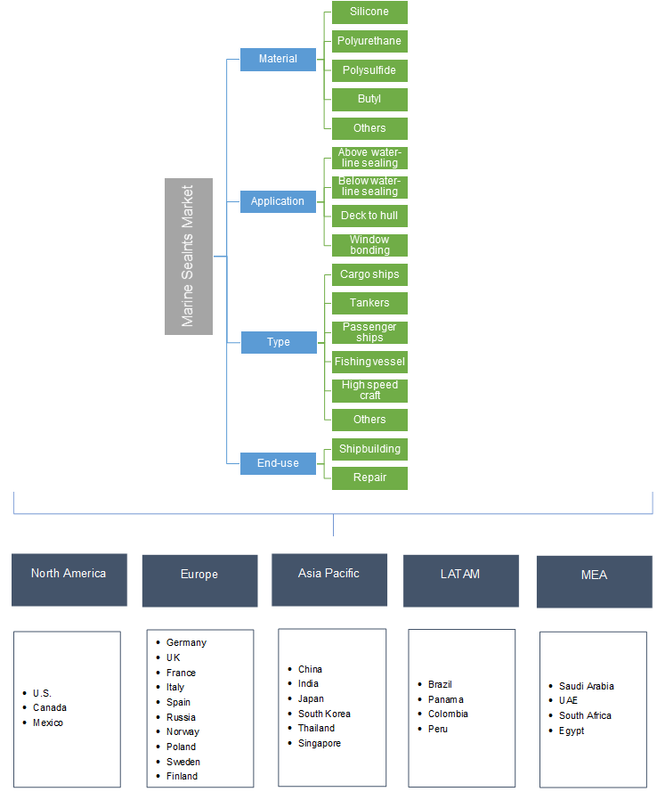 Growth in shipbuilding industry particularly in China, South Korea and Japan will drive the marine sealants market size. Potential outlook in cargo ships, tankers and passenger ships has stimulated the industry demand. Europe shipbuilding industry size was worth over USD 65 billion in 2016. Technological advancement through various industrial R&D initiatives, owing to shifting trend for sustainable products will drive the industry size. For instance, in 2016, Sika developed “i-Cure” technology for shipbuilding to make the adhesives work easier. Stringent regulatory norms by EU and REACH on the product requirements and usage has enhanced the product demand. Shifting government focus on tourism particularly in Europe and MEA has encouraged the yachts and cruise ships production. Moreover, increasing defense budget to provide advanced product range is amongst the major driving factor for the marine sealants market. Superior product features including high noise reduction, thermal insulation and low material weight has enhanced the product scope in military applications. Rising demand from several crafts including military ships, yachts, specialized power boats, navy liners, and sea tankers is expected to propel the industry demand. However, economic down turn along with rising uncertainties regarding shipbuilding regulations for imports and exports may hamper the industry growth. 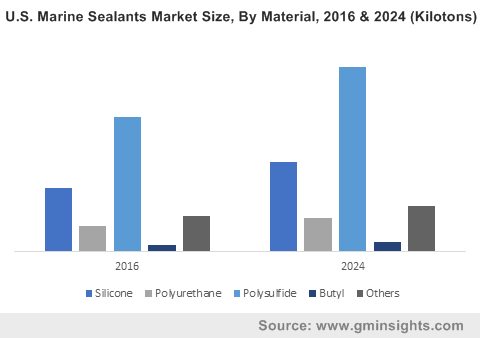 Silicone marine sealants market was valued over USD 50 million in 2016. Versatile polymeric adhesion properties providing stronger bind between the surface materials are the key properties driving the product demand. Furthermore, it is highly water resistant offering a wide range of applications in aquaria, high speed crafts, passenger ships, tanker and cargo ships. Polysulfide is expected to register over 30 kilo tons by 2024. Effective product usage in both above and below the waterline applications will provide positive outlook for the business growth. Increasing preference for polysulfide due to its benefits including optimum elasticity and flexibility particularly in hardware sealing will fuel the product demand. Polyurethane holds permanent and sturdy adhesion strength, making it feasible to be applied on both above and below the waterline application. The product is well recognized as best suited for permanent bonding owing to its high gluing strength. It is projected to observe noteworthy growth due to its effectiveness in ship building infrastructure. Above water-line sealing will witness gains at 4.5% up to 2024. Effectiveness in enhancing extreme flexibility and toughness are key for both maritime repair and OEM construction applications. Excellent gap filling capability along with ability to be painted over and sanded easily will propel marine sealants demand. Deck to hull application was worth over USD 95 million in 2016. Presence of critical joint between the deck and hull has made the use of sealants in marine applications. Higher strength enables mechanical fixings redundant and its elasticity absorbs much of the stresses and strains. Thus, preventing from torsion forces, impact shocks and temperature changes. Window bonding will generate over 9 kilo tons till 2024. The bonded window drives beyond the traditional function of a window, offering protection from wind and rain. Its ability to provide better defense against the weathering elements than the framed window and to enhance vessel design will drive the marine sealants market size. Cargo ships was valued over USD 110 million in 2016 and is anticipated to witness growth over 6% in terms of revenue up to 2024. The shipments particularly handle a wide range seaborne door-to-door shipment across the world. Increasing product demand in bonding and sealing applications for fly bridges, interior of passenger cabins, total teak deck constructions, wall panels and work surfaces is the key driving factor for overall marine sealants market. High speed craft will witness CAGR over 4.5% up to 2024. These crafts are generally recognized as hydrofoils or hovercraft generates high product demand due to its advance gap filling technique prevent the vessel from any external impact. Increasing application of the product for joining lightweight materials on the high-speed craft will propel the overall business growth. Shipbuilding was worth over USD 140 Million in 2016. Increasing product applications in tankers and cargo ships remains the key factor driving the product scope. Global seaborne crude oil trade was 39 million barrels per day in 2016. However, substantial slowdown of the tanker business from crude oil products may hinder the demand. Marine sealants have effectively reduced the repair and construction cost by providing high durability and water resilient features. Europe marine sealants market was valued over USD 95 million in 2016. Growth in yacht building industry coupled with increasing cargo trade will drive the regional demand. However, the region is expected to witness economic uncertainties and stringent emission regulations for fleet dealers to shift to environment friendly products. Increasing R&D initiatives for environment friendly products will create new opportunities for industry growth. APAC is anticipated to value over USD 100 Million by 2024. High investments in ships maintenance mainly in China, Japan, India and South Korea will propel marine sealants market growth. This high growth is also credited to expansion of manufacturing capacity, competitive production costs, and several strategic developments. Global marine sealants market is highly competitive due to wide presence of small as well as multinational players operating on regional and global levels. Raw material costs play a vital role in the overall profitability of industry players. Some of the key players operating in the industry include SABA, Dow Corning Corporation, 3M, Bostik, Henkel AG & Company, Adshead Ratcliffe & Co, Sika and Bostik. Development of sustainable and environment friendly products is the dynamic trend are the major strategies adopted among the industry players. Other prominent players in the marine sealants market are Illinois Tool Works, RPM International, Franklin International, Avery Dennison and H.B. Fuller. The companies are involved in mergers & acquisitions, joint venture and manufacturing capacity expansion along with product portfolio expansion and agreements to gain a competitive advantage. Manufacturers usually face unique challenges compared to other industries when undergoing continuous or lean advancement initiatives. These challenges include curing times, chemical reactions, long setups, uneven batch sizes, regulatory mandates, regular cleaning requirements and various technical processes that must be tightly controlled. However, growth in shipbuilding industry though heavy investments by both governmental and private players will support the applicability of the product and thereby, boost the overall industry share in the forecast timeframe.